The closest to what you want would be either the Conqueror Companion or Commander. 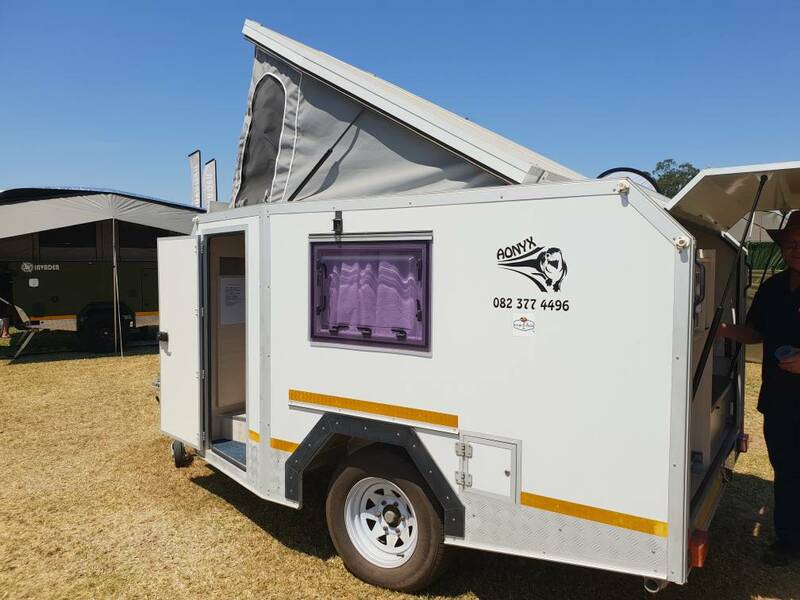 They are the market leaders in SA and won 'shoot outs' with other brands and was also nominated 4x4 caravan of the year a few times now, go rent one for a week and decide yourself. There are a lot of options out there, difficult choices. 2016 LC 200 VX, 2014 D4 SDV6 HSE(sold),2015 Suzuki Jimny, 2016 VW Amarok 4motion DC(work vehicle), "A little Red Car", Swambo 2013 A3 Sportback Quattro, Bush Lapa Boskriek 567, Fusion 17 boat-Yamaha 70hp 4st. Also never compared the smaller brands to the big names. I know of BL and Conqueror owners that have changed to our trailers. Personal choice I assume. Hyades, as my wife (Kremetart) said, you will not get what you want all in one. What we did, Roadque made an axle same as our vehicle (width and rim size) I made the van same width as tow vehicle, because I dont like side tow mirrors in the bush. Length was 3 200mm - double bed lengthwise, space to stand to change clothes and space for clothes. We got a fridge inside, sliding kitchen unit, sliding deep freeze and fold out kitchen with table. 220v/12v system with 2 x batteries and packing space under the bed. Roof lift on one side. We took it to the weigh bridge fully loaded with clothes etc, and she only weighed in at 940 kg, and that only at 30% cost of something similar on the market. Our trips included Kgalagadi, the 4x4 rout to Mabuaseabi, Moremi and Etoshia, with not one problem. I would suggest, if you are handy, build one to your needs. Hyades, have a look at a Summit Everest. Funny posts belong in the Pub section please. We changed to an off road caravan, Afrispoor Buffel, and just love it! David, of Afrispoor, is amazing at modifying his models to just what you want. I just can’t get over the fact that if I had to buy a new offroad trailer/caravan that it would be considerably more expensive than any house I have ever bought. Cars are stupidly expensive in this country but offroad trailers and caravans even more so. Last edited by SimonB; 2018/09/11 at 08:17 PM. Last edited by Kooskop; 2018/09/12 at 09:05 AM. It was voted by the Caravan and Outdoor life as the winner. I know of a few BL owners that sold theirs due to various reasons. Anybody that needs to make a decision like this needs to gather information and actually test the information gathered. 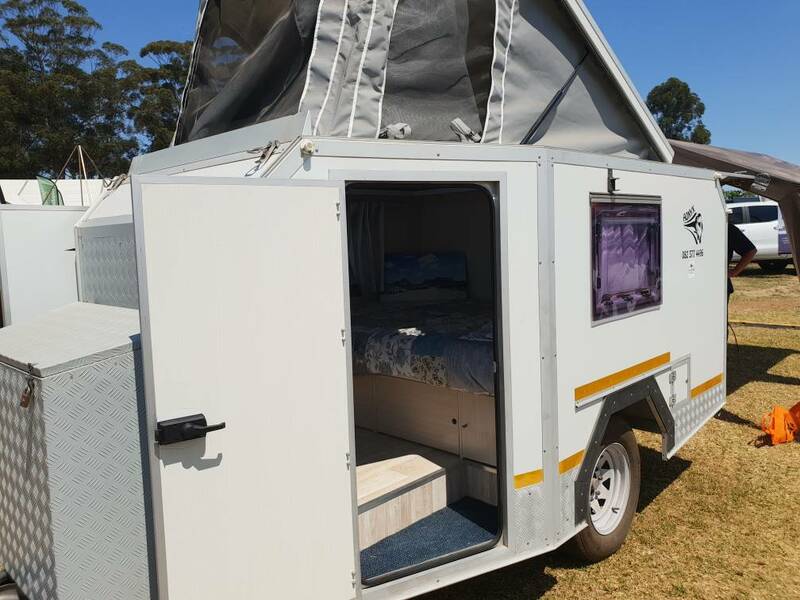 After you have short list of 3 or 4 possibilities rather go and rent each one for 3-5 days and go camping in all types of weather. We had the same worries in the '70s and made some decisions that was OK for the times then and our situation - young one born in '81. End 2000 the daughter left home and we reverted back to a tent from a caravan, 2010 the decision was made no more tent and mid 2011 we bought an Echo 4 that served us well (44 000km). The age factor started creeping in (including my younger days wild life) and the ladder/tent option became a bit of an issue at night. Looked at Echo, Afrispoor, Jurgens and one or two other manufactures. Ended up with Afrispoor, BL and Echo in that sequence. Checked each one out carefully and for some reason unknown the BL-Kewer ended on top. In 2017 we bought a BL-Kewer, for us it was the best option (Serval came second and the Echo was right on its heels). Did quite a few "upgrades" to the Kewer in the last 6 months, possibility of a few more cropping up. Danie & Marinda - die wiele is rond, dus moet hulle hardloop - afgetree nou leef ons net. 1990 Hilux 2.4D - en hy kon loop, pomp en top gewerk aan. Have to agree with Michael on this one! The issue is that house prices went up very much in the last 5 years - specially in what people in our age group are looking for. The value of decent trailers/caravans has increased considerable - second hand and new. So pick the right one. We sold the Echo 4 for the same monies we put into it - clean break. Only lost out on the two new batteries that was due for replacement any way as I was not willing to sell it with shot batteries. Looking at second hand BLs - if you can find one - the current prices are same or higher than 2-3 years ago. Same applies for the Serval an Cheeta. I'm not a fan of the trailers with the roof-top tents on them. Sure they work very well, but I'm not keen on climbing up and down ladders 3am in the morning. Also, where do you get dressed when you only have a tent on top, and not all the awnings attached. Just my opinion, but I don't think this will work for us. Now when it comes to caravans things start to get a little more comfortable. But again, for me it is over the top. I want something with a proper double bed, proper mattress, not foam, some packing space for clothes, and on the other end of the van perhaps place to sit with a table that can be pulled out if needs be, for the times you don't want to sit outside. Kitchen should be on the outside, as with the conventional vans/trailers. All can slide out from underneath the bed. I don't need toilets and showers attached to the van. In my mind, what I am describing above will be a tiny caravan, and should not weigh a lot. Is there something this simple on the market that I'm clearly missing, or will I have to build my own? Or build one yourself. At a fraction of the cost. Ja, ek dink dis wat ek gaan doen. Don't blow it, this is the only planet with beer! Only 1 recommendation for the Sherpa, I would think it ticks all the boxes.